The train seems tailor-made to be used as a metaphor for capitalism. It’s a product of the industrial revolution, propulsed by fire and cast in steel. Countless lives and limbs have been sacrificed to the locomotive gods in the name of advancement and progress. Plus, they traditionally are sectioned off by class; the more expensive the ticket you spring for, the better the experience. Bong Joon-ho’s post-apocalyptic class warfare film Snowpiercer not only milks the metaphor for all its worth, but goes one step further by turning the microcosm into the macrocosm. In short, the world’s attempt at fighting global warming completely backfires, turning the Earth into an inhospitable frozen wasteland. The only survivors are those aboard an über-train that circles the earth once a year. The citizens nearest to the engine are the 1%, while the rabble and the criminals are stuck in the back, cramped and living in abhorrent conditions. Snowpiercer’s use of the train as a metaphor isn’t exactly elegant, but what it lacks in subtlety, it makes up for in visceral impact, technical skill, and dogged determination to see its batshit premise all the way to the bitter end. The film starts off as a familiar, though eccentrically-delivered, social-drama potboiler: de facto leader of the downtrodden Chris Evans and his ragtag group of rear-car revolutionaries plot the overthrowing of the social order by jamming the train’s perpetual-motion engine. But as the film goes on, the eccentricities start taking hold. There are the bugged-out fight sequences, which go from frustratingly chaotic flashes of flesh being compromised to poetic slow-mo long takes of Evans taking care of business with a hatchet. The film is also littered with heavy doses of weird humour, like having a very pregnant elementary school teacher played by Alison Pill leading kids in a church organ-scored sing-a-long that starts “What happens when the engine stops?/We all freeze and die!” Or having Cream’s “Strange Brew” on the soundtrack while Evans discovers what the poor-person protein bars are made from. A whole fight sequence happens in night vision. There are also a ton of textural asides that, while not explicitly moving the story alone, help flesh out the world and give it a little texture: the characters pause in the aquarium car to have some sushi, or the recurring presence of an okay-not-great sketch artist who doubles as a historian. And then there are the performances. Though many of the roles don’t evolve much beyond genre tropes (the hesitant leader, the old sage, the comic-relief right-hand-man), they get accented in truly bizarre ways. Chris Evans’ skills are underused in the generic brooding hero role, but his speech about the horrible early days on the train manages to be grotesque, melodramatic, earnest, and hilarious at the same time. Bong stable member Song Kang-ho brings remarkable flair and intensity to what could have been a one-note role as a junkie security expert. But best of all is Tilda Swinton, playing a government stooge with a set of fake teeth and the craziest accent I’ve heard this side of Nicolas Cage’s vocal whatsit from Vampire’s Kiss. She doesn’t as much chew the scenery as feed it through a meat grinder, punctuating her sentences with sputters and tics. She actually pulls out her fake teeth at one point while begging Evans for mercy. That moment is exemplary of the kind of tonal pinball Bong likes to play in his films, whipping from ghastly violence to gallows humour and back in the blink of an eye. Rather than compromising the film’s unity, this approach lends a sense of vitality and unpredictability to the way the story is presented. The genius of Snowpiercer isn’t its story or its premise, but how Bong brings it to life. All in all, Snowpiercer has the same off-kilter feel as Terry Gilliam’s Brazil, but with the key difference that it’s pocket-sized. 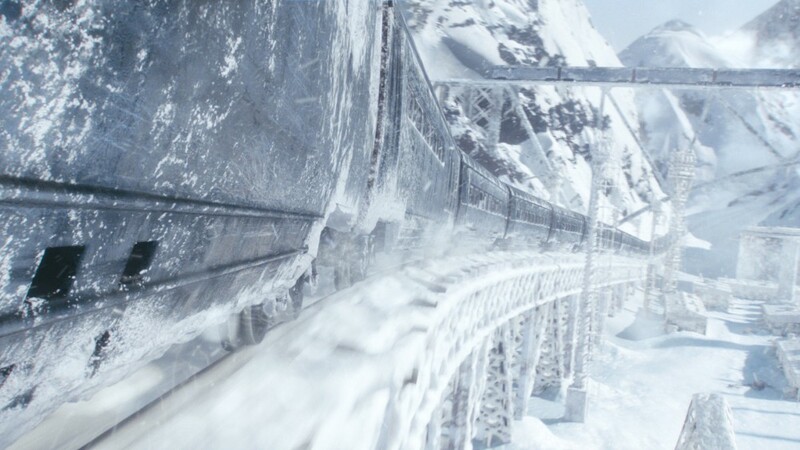 In fact, Snowpiercer is a miracle of set design, making the train feel wide-open at times, and punishingly claustrophobic during others. Also, Snowpiercer’s specific brand of nihilism also separates it from Gilliam’s film. Where Brazil depicted the absurdity of bureaucracy and the ills of a consumerist society,Snowpiercer is more interested in the toxicity of classism and tragic endgame of revolutions. 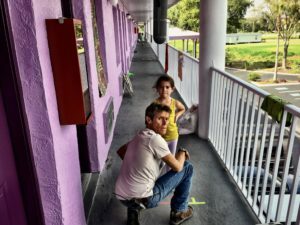 The bitter pill that the film makes us swallow is that the system in place (in this case capitalism, classism) has a buffer zone that takes uprisings into consideration. The more power gets consolidated, the easier it is to predict, contain, and ultimately, deliberately provoke revolutions. The film’s solution is bold and ultimately sad, but offers some glimmer of humanist hope. But not too much. After all, this is a film that manages to boil down the essence of capitalism down to a single striking visual metaphor: a child of colour locked under the floorboards of the head train car, sitting among the gears to perform the task of an obsolete part. A literal cog in the machine. Directed by Bong Joon-ho; written by Bong Joon-ho and Kelly Masterson; based on Le Transperceneige by Jacques Lob, Benjamin Legrand, and Jean-Marc Rochette; starring Chris Evans, Song Kang-ho, Go Ah-sung, Jaime Bell, Alison Pill, John Hurt, Tilda Swinton, Octavia Spencer, and Ed Harris; 126 minutes. Snowpiercer is currently available for purchase on Blu-ray and DVD , as well as for purchase or rental on Amazon Instant Video .